Stone began his culinary career whilst working under Alain Vincey in 1987 at Vincey's restaurant La Maisonette in Richmond, Virginia. He left the restaurant in 1991, and in November 1993 he started his own catering company alongside his wife, called "A Sharper Palate". He founded his barbecue team "Cool Smoke" in 2004, and cooks alongside his father George. He describes himself as a traditional wood burner, and tends to use hickory wood in his smoking. Stone and his team compete on the competitive barbecue circuit. He owns a Virginian based local chain barbecue restaurant called "Q Barbeque". He was the Grand Champion of the 2006 Albertsville competition, which was organized by the Kansas City Barbecue Society. In 2010, he was named Grand Champion of the Maryland State BBQ Championship.The same year, he appeared on TLC's BBQ Pitmasters. He became a judge on the show in season three, when the show was moved to the Destination America cable channel. He joined Myron Mixon who returned from judging on season two, having previously appeared with Stone in season one, with the pair being joined by Aaron Franklin. 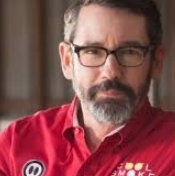 Stone served as a judge at the Kingsford Invitational where the winners of eight major barbecue competitions were invited to compete for a grand prize of $50,000. The event was won by Melissa Cookston and her "Yazoo's Delta Q" team. Tuffy's team Cool Smoke won the 2013 Jack Daniel's Invitational BBQ competition in Lynchburg, TN on October 26, 2013. Cool Smoke won the 35th Annual American Royal World Series of Barbecue Open on October 5, 2014. Tuffy's team Cool Smoke won the 2015 Jack Daniel's Invitational BBQ competition in Lynchburg, TN for the second time on October 24, 2015, and became the first team to repeat as Grand Champion at the event the following year in October 2016.